Unlike most of my scenes, this one was planned as an animation from the start. Most of my scenes take at least an hour to render a single frame (and some take much much more). For this project I wanted each frame to take under 2 minutes to render so I've tried to keep things relatively simple. Figuring out how to animate the scene in a pleasing manner took much longer than setting up the still shot! I rendered the animation at 3840 x 2160 but it appears I need some new software to encode a video at UHD. Stay tuned! Your abstracts are the best out there. Keep up the good work Ryan. The simplicity of this one makes it an excellent desktop background, honestly. That's why I love the abstracts. Simple, elegant, and beautiful. This is so cool!! I love your abstracts. Can't wait to put it on my 2x4k at work! I would love a pickle jar version of this that goes from black to green to yellow to red. Actually, I would love a print like that. It would look awesome in my recording studio. Howdy _ curious about what inspired you to create this piece. The detail and colors, shading and lighting allows for one's eyes to meander through your creation. Good job! AKA, Ryan, you've got a winner here, but is there any way you can slow the animation a tad? Concerned about visual distraction in my periphery. "10 = das vewy noice"
I agree with "Impune"'s review -- really good image, really like the simplified geometry (even if it due to render requirements, I really like the look of this) -- but the motion could be better. I spent a few minutes trying to compose an appropriate comment -- and pretty much failed. I just like looking at it. Maybe that's all that needs to be said. Well done yet again. Thank you Ryan. "This is why I signed up for DB"
Ryan, your abstracts like this one are exactly the reason I signed up for DB all those years ago. Keep these coming, please! Landscapes are cool and all, but these are really your strong suits. Question: How do I set this as a moving background now? Can't wait to see how this turns out. Hope to see more of this from you. This is already so beautiful but the animation falls a little flat. It's too fast and has no logic. Could you create a sort of wave effect by varying color and height of blocks according to math functions? There's a challenge for you! The color combinations are perfect. Such depth. Plus, the animation is really fun. Can't wait to get this in motion!! 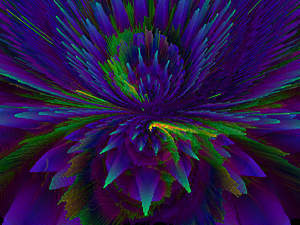 I love the colors and the abstract nature. I tend to lean toward your blue artwork, but the color combinations here are fantastic! Well Done Sir! Wonderful abstract, Ryan! I love its simple yet eye-catching composition and I particularly love the color scheme. Great work, as usual! Wow - that animation was off the charts!! Love the render, love the animation. Spectacular!! Great job, Ryan, and THANK YOU!! Excellent 3D effect! Well done Ryan! This is beautiful. I've snagged the still for the desktop now - but a question about the video - if I use your final animated version, will I be able to manually control the speed? Right now, it's a bit too fast to be relaxing. Like an AI's dream about a virtual digital sea or an interesting chart of the 'brainwaves' of a computer entity. I can't make up my mind if I like the still or the motion better. The incredible clarity of the colors in the still is hard to deny. Home run here Ryan. "Love this one, moving or not"
I really like this both as a wallpaper and animation for Wallpaper Engine. Could you consider doing double and triple screen animations for things like this, even if you had to reduce the resolution to 5760x1080? It should still render faster than a 4k animation and would totally rock! Love the colours, static or animated both look good. This is really fun! Like Sean's idea of a wave movement too. Love your abstracts. This one is another instant favorite! I'm digging this one. For some reason, I was expecting the animation to be more of a wave. Might be cool too. Really do love both the still and the animation! I don't usually care to much for the abstracts you do but I love the colors on this one. They really appeal to me and I love the animation as well. Love both the still and animated versions. these colors! I love these colors! this wall paper is incredible! "Love this one, need more that are similar to this!" Love this style of background!!! Thanks for bringing back the large res multi screens! Love it. Looks like it's part of a bigger picture. This might be my new Twitter and FB header. 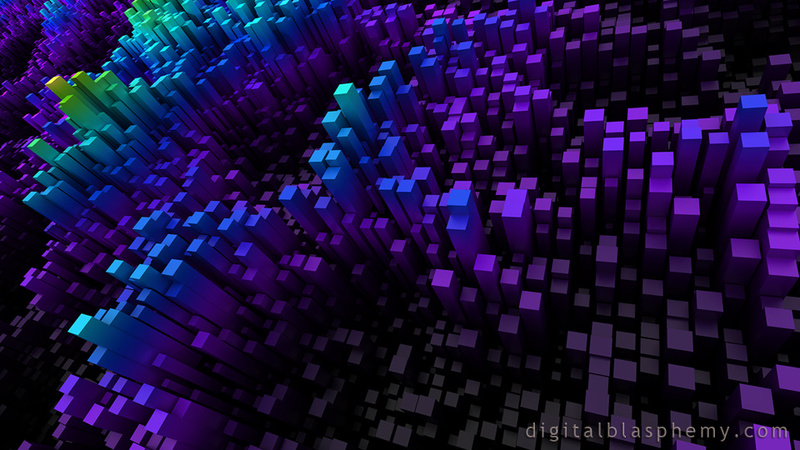 I love the simplicity of the blocks with the complexity of the size and color.